So apparently, according to this Slate article, math causes a “hazy, anxious, defensive procrastination” that hinders some people’s already limited understanding of numbers. Oh really! Well, I must admit that’s me to a T. There’s just one minor distinction: Whereas the author met his numerical numbing in a college topology course (whatever that is), my frustration emerged with second grade’s two-digit addition and subtraction. Interestingly, the author’s symptoms as a struggling student paralleled those of the math students he now teaches—”muddled, half-comprehension; shyness about getting the teacher’s help; procrastination; and feeling incurably stupid.” Oh, how I can relate! I specifically remember the day my mind wandered out the window for what seemed like a minuscule of a second and when I begrudgingly pulled it back to arithmetic (that’s what we called it back then), the teacher had moved on without me. I’ve been behind ever since. Most intriguing is how, according to the author, instead of asking for help, frustrated students everywhere take on the same defensive “I hate math” that I did. They too develop a mental block against numbers. Of course, I now know being mathematically challenged doesn’t make one stupid. I know everyone has their own area of expertise. And I know asking for help is a really good thing. What about you? 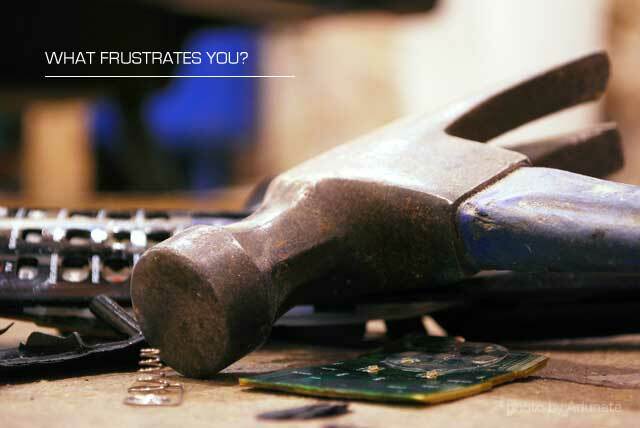 What frustrates you? Are you asking for help? If you don’t jibe much with words and design, I’m the one to ask. Numbers may not be my forte, but I’m A+ at writing, designing and making you look good!